Bring one cup of coke to a boil in a small saucepan. Spray mold with baking spray to help them slip out easier. Remove from heat and sprinkle gelatin on top. Let rest for 3 minutes. Whisk until gelatin has fully dissolved. Add 1/2 cup cold coke and 1/2 cup spiced rum. Whisk until fully incorporated. Pour into molds. It's best to have molds on a cookie sheet so that they don't move when you transfer them to the fridge. Place in fridge. and let it set for up to 2 hours. Remove from molds. Put whipped cream (store bought or homemade) into a piping bag and pipe the laces on to the footballs. I care deeply about the Super Bowl for two reasons: Food and Beverage. I tend to care even more about the beverages! Especially if the game is a blow out. 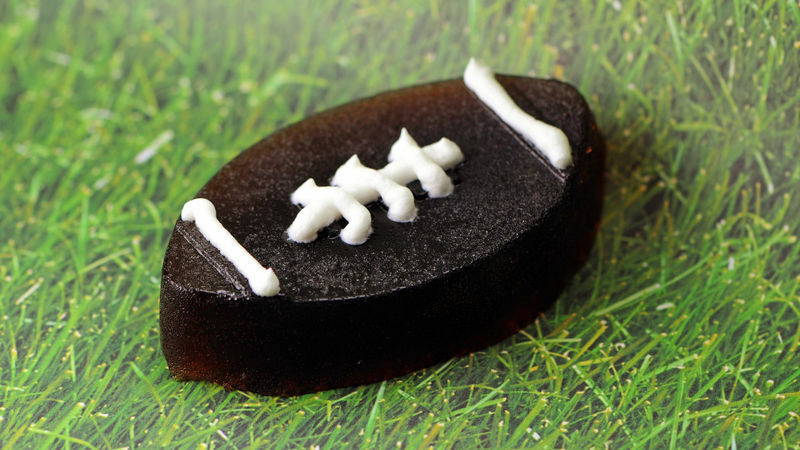 In addition to severing beer, put some kick into your kick off with Spiced Rum and Coke Football Jelly Shots! Almost everyone loves a classic Rum and Coke, but as a jelly shot? Oh yeah! And I think Spiced Rum gives it a little something extra. The football shape just makes things extra festive. Usually the men may not appreciate the effort, but the ladies will take notice. Also your prep shows you are into the game – even if you spend the game talking with the other girls, taking guesses at what Kim Kardashian will be naming her baby or talking Downton Abbey. Just make sure to shout at the refs every now and then. Remove from heat and sprinkle in gelatin. Let rest for 3 minutes. Whisk until gelatin has fully dissolved. Add ½ cup cold Coke. Add ½ cup Spiced Rum. Pour into molds. Make sure to have the molds on a cookie sheet to help stabilize the molds when being transferred in and out of the fridge. Pipe on whipped cream and you are ready for the game. Regardless if your team is in the Super Bowl or not… you can always cheer for Team Jelly Shot and be sure a win.